The popular saying that “a goldfish in a bowl has no hiding place”, is currently playing out with the British contraption called Nigeria. It took place during the last trial of Biafrans in the Nigerian court, which took place Tuesday~Thursday, March 26-28, 2019. It made Nigeria and its kangaroo judiciary goldfish that has no hiding place. It was the trial of the four Biafrans, who were associates of Nnamdi Kanu, leader of Indigenous People of Biafra (IPOB). Most Nigeria media made a blanket ban on the proceedings while those who dared to report it either lied or distorted it. It was not surprising because it was observed that few Nigerian media houses were available in court on the day. However, to their shame, all they do not want to be known to the world is being exposed without let or hindrance. Now, it is apparent to Nigerian authorities that whether they write about the Biafra issues or not, the world is getting the full information. In addition, all the shenanigans of Justice Binta Murtala-Nyako's court are being made known to the world unhindered. 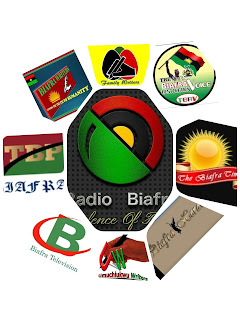 This is because Biafra has virile media – magazines, newspapers, radio, television, and social media – is alive and well. Of course, this is the handwork of Nnamdi Kanu, the Biafran leader, and the Indigenous People of Biafra (IPOB) he leads. Before he was arrested in 2015, he had told the world that he understood many things about Nigeria and how it would try to undermine the Biafra agitation. One of the ways he said Nigeria would try to stop the Biafra agitation would be through the media. Speaking further, he had explained that what Nigeria had been doing, and would continue to do, would be to place a media blanket on the Biafran issue. He said the government will intimidate the media in Nigeria, and bribe international media to make sure that all the atrocities they would be perpetrating against Biafrans will not be reported. On the other hand, he contended that whenever they (the Nigerian media) would dare to publish anything about Biafra that it would be to lie or distort the truth. He said he would make nonsense of whatever blanket the accursed country would want to place on Biafrans as the struggle progressed. Today he has achieved. By the time Nigeria struck, he had built a virile and fearless media that took Nigerians and the world by storm. The Biafran media was able to withstand all the pranks of Nigeria and its media; to override the dubious silence of the world media. That was why and how, for instance, the world was kept abreast of what was going on in court in the two days of March 25th and 26th. That was why the world got to know that Engineer Chidiebere Onwudiwe was tortured severally by Nigeria’s Department of State Security (DSS) to have him sign their fake and doctored statements. That is how Biafra media made Nigeria a goldfish in a bowl that has no hiding place. No going back, the Yoruba Nigeria Media all of them will be put put yo shame. All hail Biafra.